1988 version of Flyer, can be found in Koga's 1988 catalogue. Most of the parts are original and in very good condition. Hubs, BB and headset have been cleaned and serviced, hub bearings have been replaced just in case. Ive been building this bike up over the last few weeks and just wondering what it might be worth. New rear wheel, chain, cables and saddle, bar tape. Not been able to track down any real information on this bike online so no idea if all parts are original or not. Really aggressive riding position with the top tube angle and drop stem. Thinking of selling my Graham Weigh 853 frame & forks. Pretty sure it's a Paul Donohue built frame. 57cm, free of dents, cracks etc. Paintwork is tatty - seatpost and BB were stuck so caustic soda has been used to dissolve the aluminium post and BB cups (steel hasn't been affected). It has a Dura Ace headset fitted. Currently built up as fixed wheel but will be selling just as frame + forks. I was thinking around £120 - would this sound right? In a post about an SBDU bike I noticed someone mentioning the EDCO headset and saying the gold one was rare. I've got one of these which I bought years ago on the understanding that it had been fitted to a display bike but never been on the road and the condition would support that. Unfortunately the anodizing on the on the top cup and the locknut have been slightly marked by a spanner during removal. I'm not going to be using it so before I advertise it, what would be a fair price? Could no doubt maximise price on the bay but I'd like it to go to a good home on here but by the same token, not give it away. Thanks for any advice. Yep,. I think it was RJ Chicken and Sons who brought in EDCO stuff but I don't remember many gold ones. There's a silver one on eBay from the states for £300 odd quid but if yours is in good nick and someone is on the lookout then maybe £80-£90 ? Problem is that there may not be many people on the lookout as Gold anodised stuff BITD was an acquired taste. Mafac did gold as did Stronglight and Simplex. Maybe it was a Euro thing? Thanks for that, I had a set of Mafac racers in gold a few years back NIB and not to my taste. Sold them at Ripley jumble for not very much if I remember. I'll try the headset on here at some point. I found this bike locally and the owner wants £60. 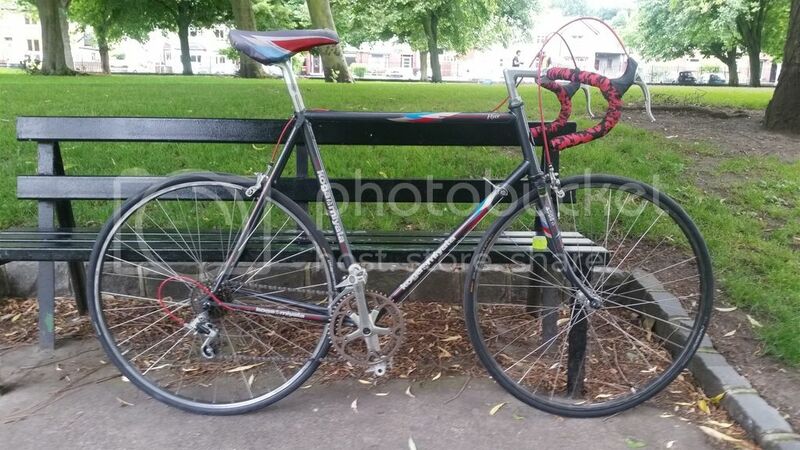 Unable to attach pictures but its rear triangle is blue and the rest is white,owner states it's a 12 speed,I reckon an 80's bike,maybe carbolite? It's only for an odd commute and long ride in the weekend. Any major issues with these?? Also found a non retro (tut tut) Carrera TDF about 5/6 years old, aluminium frame for around the same cash. Now I love a project but it would be great to get a bike and not have to tinker so much to get it going. The reviews I have found for the TDF seems to suggest it's a solid bike but there have been many variants of this bike so it's hard to know exactly. It's yellow with black forks if that helps,forks may be an after market fit I don't know. Any thoughts on these are greatly appreciated. Hard to know really without seeing them. Don't know much about the Carrera TDF but they have been around for a while. Have you a link to some photos? I'm afraid no pics,I can't seem to get the attachment working,I can't see to find the exact same model via a Google search which is discorcenting. I might just plump for the newer TDF as it might be less work long term,faster for a commute as well I would suppose. Never had aluminium for a bike before,I used to be all steel is real so it's a jump for me,the retro lover in me is screaming no!! Would appreciate a valuation on this, recently refurbished Colnago Master. Campag super record groupset throughout, Including Pantographed chainrings and shifters.